According to recent studies extra virgin olive oil can help fight against high blood pressure. A new study from the University of California at Davis Olive Center, found that just taking two tablespoons of EVOO a day could significantly lower high blood pressure. The high levels of nutritious phenols produced in the slow cold pressed process of extra virgin olive oil are easily destroyed when processed as regular oil. And although scientists are still trying to understand phenolic effects on the human body, more and more evidence is pointing toward EVOO as an important dietary supplement when working to combat high blood pressure, along with various other conditions. But exactly how do people go about taking olive by the tablespoonful? Although we love the taste of My Olive Tree’s Extra Virgin Olive Oil, we know that it may be a stretch for some to take heaping tablespoons of the oil plain—even if it does improve your health and substantially lower high blood pressure. So, we took some time out to think about different ways you might disguise the oil, without losing the benefits of drinking it raw. Recently, we tried a new smoothie recipe and included the My Olive Tree EVOO in it. We have to admit that when we first began this endeavor, we too were skeptical. An olive oil smoothie? 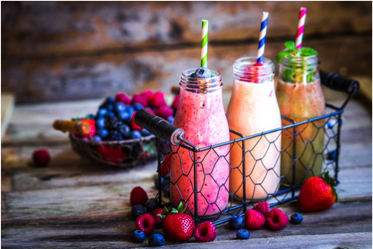 Yeah right… but much to our own delight, this smoothie is DELICIOUS! You may need to adjust the ingredients slightly depending on your own taste buds, but this will give a great starting point. Directions: Blend until smooth. Pour into a glass. Enjoy! Italian Soak 2 tablespoons minced red onion in cold water, 15 minutes; drain. Pile 1/2 garlic clove, 2 tablespoons fresh parsley, 1 teaspoon dried oregano and 1/2 teaspoon kosher salt on aboard; chop and mash into a paste. Whisk with 2 tablespoons red wine vinegar and the onion. Gradually whisk in 1/2 cup olive oil. Lemon Balsamic: Whisk 2 tablespoons balsamic vinegar, 1 tablespoon lemon juice, 2 teaspoons Dijon mustard, 1/2 teaspoon kosher salt, and pepper to taste. Gradually whisk in 1/2 cup olive oil. Basil-Walnut: Blend 3/4 cup olive oil, 3 tablespoons each toasted walnuts and lemon juice, 1 cup fresh basil, 1 garlic clove and 1 teaspoon kosher salt in a blender. Another way we found to help mask the oil a bit is to add citrus to the olive oil. We personally used half a lime in a glass of 1 tablespoon of oil, but a lemon or an orange would help to flavor the oil, as well. Just like anything new you try there is always that initial hurdle that you have to overcome. However, when you know the end result offers you greater health benefits, it makes the fear factor worth it. If you are struggling with adding raw extra virgin olive oil to your diet in order to help curb high blood pressure, we encourage you to try a few of these ideas! If you are looking for a high-quality brand of oil to get started on this new health adventure, why not try My Olive Tree’s Northern Extra Virgin Olive Oil? My Olive Tree’s Extra Virgin Olive Oil from Northern Israel is light and full of delicate flavor. Our Northern Israel oil is perfect for salad dressings, marinades, or as a hummus topping! It mixes well with the spices of your choice leaving you with a smooth and well-balanced flavor.